In Guatemala, chronic malnutrition is higher than any other country in the western hemisphere. In fact, Guatemala has the 5th highest level of chronic malnutrition in the world, and the highest rate of malnutrition in all of Latin America, according to United Nations statistics. 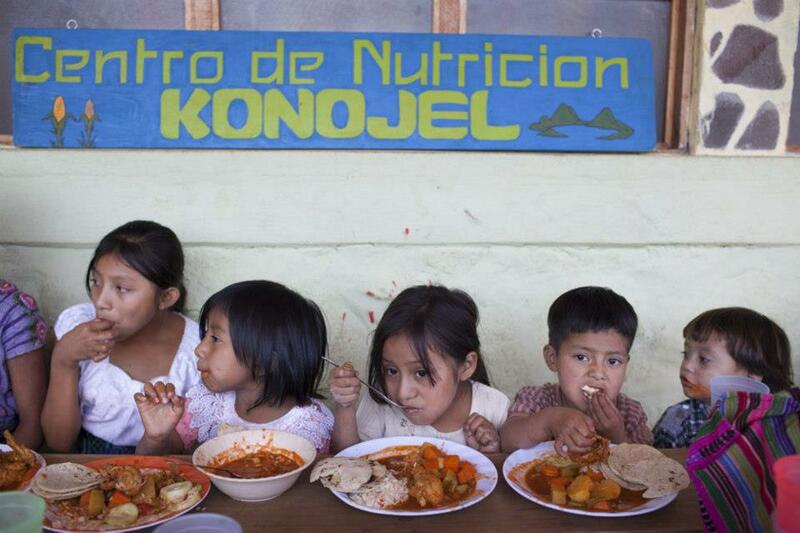 The Nutrition Center, known locally as el centro de nutrición Konojel, provides a nutritious, daily meal to 60 of the towns’ most at-risk citizens. Participants of the program, all Kaq’chikel indigenous Maya, range from young children to elders, and includes at-risk pregnant women. These people rely heavily on the food served at the shelter and have, in many cases, shown significant improvement in their overall health. Malnutrition, in addition to lowering the bodies defense against sickness and disease, is one of the biggest learning obstacles for children who are in school. Project Nuevo Mundo’s Earth Odyssey in partnership with JUSTA are beginning the implementation of an earthen solar oven and solar dehydrator that will serve as Konojel’s primary appropriate technology for producing their Solar Granola and eventually dried fruit which will serve as a revenue stream for Konojel. With the expertise of econaut, Brennan Bird, founder of Peace on Earth Bench Movement, The Earth Odyssey team will work for the next three weeks to build Konojel’s first large-scale efficient solar-oven with locally sourced materials and a large-scale solar dehydrator that is efficient and scaleable. Their intention is to plan and design a sustainable small business model to utilize solar appropriate technologies as a potential source of revenue for Konojel. Both JUSTA, Project Nuevo Mundo and the team implementing this amazing project are all ecstatic to be creating a replicable regenerative business model and helping an Impact Center that helps hundreds of people eat well on Lake Atitlan! Brennan Bird with his Solar Oven he built for our Earth Odyssey Camp! Stay tuned for photo updates of the progress!